Birds and wildlife benefit from the food and water we offer them, but what about us? Do we benefit too? At Backyard Bird Shop, the day to day stories we share really speak to that scientific truth. For starters, feeding birds make us more active. Rain or shine, we get out and fill the feeders. That’s because we know the enjoyment we get from watching birds and wildlife, so keeping those feeders filled is high on the priority list! Seeing new birds and new behavior is exciting and stimulates us to learn more about them. Learning contributes to our brain health. Many folks set up bird and wildlife feeders for dear ones who cannot get out on their own. Having birds and squirrels visit regularly provides company and entertainment. There is comfort in routine and excitement in the unexpected. We hear the same joy from those who have ditched the commute and work at home, too. 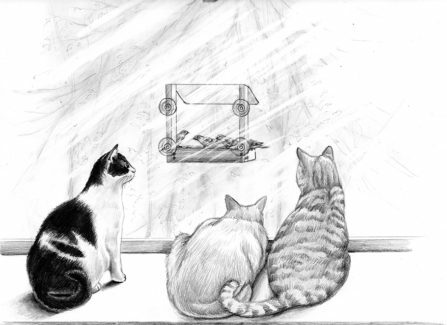 Watching birds and squirrels at the feeders is also fun for our pets. Customers often share, “It’s my indoor cat’s TV!” This activity provides stimulation for our indoor pets when they are home alone. The need to be useful and of value is natural, universal and healthy. As we provide for others, we gain a sense of belonging and self-worth. Being needed motivates us in a special way. It’s true! The simple act of feeding birds and wildlife obviously feeds us, too.